The Post-Fermentation Fortification Calculator determines the amounts of fortifier and sweetener to add to a given wine to yield a fortified wine with the desired alcohol content, sugar content, and volume. Alternatively, the resulting alcohol content, sugar content, and volume can be calculated from the specified fortifier and sweetener additions. The sweetener can be either sugar, honey, or concentrate. Specify Target Alcohol & Sugar > Calculate Additions and Volume – Specify the desired alcohol and sugar contents, and FermCalc will calculate the required additions of fortifier and sweetener to achieve the targets, as well as the resulting volume after the additions. 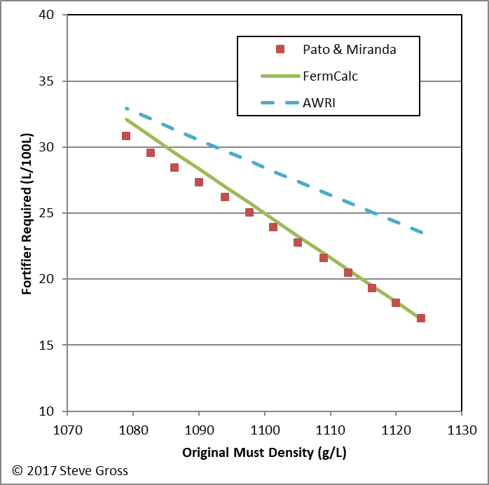 Specify Target Alcohol, Sugar, & Volume > Calculate Additions – Specify the desired alcohol content, sugar content, and volume, and FermCalc will calculate the required amounts of wine, fortifier, and sweetener to achieve all three targets. Specify Additions > Calculate Resulting Alcohol, Sugar, & Volume – Specify the amounts of fortifier and sweetener to be added, and FermCalc will calculate the resulting alcohol content, sugar content, and volume. All volumes and specific gravities have a temperature basis of 20°C (68°F). It is assumed that the fortifier contains only ethanol and water, and that the sweetener contains only sucrose and water. Specific gravities for all liquids containing both ethanol and sucrose are calculated using the Hackbarth model. Sweetener – The type of sweetener to be added, either sugar, honey, or concentrate. The SG of the sweetener must be specified if honey or concentrate is selected. Fortifier Alcohol Content – The alcohol content of the fortifier being added. Target Alcohol Content – The desired alcohol content of the fortified wine. 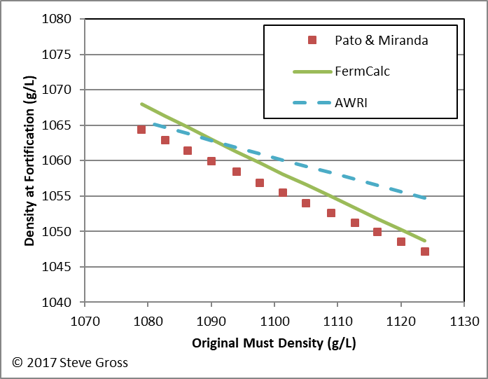 Target Sugar Content – The desired total solids content of the fortified wine. Wine Volume – The volume of the wine prior to fortification. Required only if either the first or third calculation option is selected. Target Volume – The desired volume of the wine after fortification. Required only if the second calculation option is selected. Wine Alcohol Content – The original alcohol content of the wine being fortified. Wine Sugar Content – The total solids content (true Brix) of the wine being fortified. Fortifier Added – The amount of fortifier added to the wine. Required only if the third calculation option is selected. Sugar (or Honey or Concentrate) Added – The amount of sweetener added to the wine. Required only if the third calculation option is selected. Fortifier Required – The calculated amount of fortifier required to yield the desired alcohol content, sugar content, and volume. Reported only if either the first or second calculation option is selected. Sugar (or Honey or Concentrate) Required – The calculated amount of sweetener required to yield the desired alcohol content, sugar content, and volume. Reported only if either the first or second calculation option is selected. Wine Required – The volume of wine required to yield the desired alcohol content, sugar content, and volume. Reported only if the second calculation option is selected. Resulting Volume – The calculated volume of the fortified win after adding the specified amounts of fortifier and sweetener. Reported only if either the first or third calculation option is selected. Resulting Alcohol Content – The alcohol content of the fortified wine after adding the specified amounts of fortifier and sweetener. Reported only if the third calculation option is selected. Resulting Sugar Content – The total solids content of the fortified wine after adding the specified amounts of fortifier and sweetener. Reported only if the third calculation option is selected. Where Bs is the Brix of the sweetener. Equations (16) through (18) form the basis for all of these calculations. They'll just be re-arranged and solved differently depending on what we're solving for. In this case the known values are vi, sgi, awi, Bi, sgf, awf, Bf, sgfa, and awfa. We need to solve for vfa, msa, and vf. In this case the known values are sgi, awi, Bi, vf, sgf, awf, Bf, sgfa, and awfa. We need to solve for vfa, msa, and vi. Then we can solve equations (20) and (21) for the amounts of fortifier and sweetener to add. In this case the known values are vi, sgi, awi, Bi, vfa, sgfa, awfa, and msa. We need to solve for vf, sgf, awf, and Bf. Port wine is traditionally made by adding a fortifier to a fermenting grape must at a specific point during the fermentation. The addition of the fortifier stops the fermentation by elevating the alcohol content of the must above the alcohol tolerance ot the yeast, thereby leaving the desired amount of residual sugar. The fortifier is traditionally a distilled wine spirit, known as aguardente or brandy, with an alcohol content of 76-78% v/v. The Fortification Point Calculator determines 1) the specific gravity (SG) at which to stop an active fermentation to yield the desired level of residual sugar in a fortified wine, and 2) the amount of fortifier required yield the desired alcohol level. It accounts for the alcohol produced during fermentation, and for the dilution of the residual sugar by the addition of the fortifier. After this "ideal" fortification point is calculated, the user has the option to override the calculated value of SG at the fortification point in order to model the impact of fortifying at a different SG. If the entered SG is lower than the ideal value, then there is not enough residual sugar to achieve the target sugar content, so the sweetener addition required to achieve the target sugar content is calculated. If the entered SG is higher than the ideal value, the sugar content will exceed the target sugar content after fortification, so the resulting sugar content after the addition of fortifier is calculated. All volumes and specific gravities have a temperature basis of 20°C (68°F). It is assumed that the fortifier contains only ethanol and water, and that the sweetener contains only sucrose and water. Sweetener – The type of sweetener to be added, either sugar, honey, or concentrate. The SG of the sweetener must be specified if honey or concentrate is selected. This is only used if the user enters a value of wine SG at fortification that is less than the "ideal" value, in which case the addition of a sweetener is required to achieve the target sugar content. Wine Volume – The volume of the fermenting wine at the time of fortification. If this volume option is selected, the resulting volume after fortification is calculated. Target Volume – The volume of the fortified wine after the addition of the calculated fortifier and sweetener additions. If this volume option is selected, the required wine volume at the fortification point is calculated. Initial Must SG – The SG of the must prior to the start of fermentation. Target Sugar Content – The desired total solids content of the fortified wine after the addition of fortifier and sweetener. Wine SG at Fortification – The SG of the fermenting wine at the time of fortification. This field can serve either as an input field or an output field. Initially the "ideal" fortification point SG is calculated based on the inputs above. If the calculated value is overridden by the user, then either the target sugar content or the required sweetener addition are calculated, depending on whether the entered SG value is greater than or less than the ideal value. Wine Alcohol Content – The calculated alcohol content of the fermenting wine at the fortification point. Wine Sugar Content – The calculated total solids content (true Brix) of the fermenting wine at the fortification point. Wine Required – The volume of fermenting wine required to yield the desired alcohol content, sugar content, and volume. Reported only if target volume is selected as the volume option above. Fortifier Required – The calculated amount of fortifier required to yield the desired alcohol content, sugar content, and volume. Sugar (or Honey or Concentrate) Required – The calculated amount of sweetener required to yield the desired alcohol content, sugar content, and volume. This will be zero unless the user enters a wine SG at fortification that is less than the "ideal" value. Resulting Volume – The calculated volume of the fortified wine after adding the specified amounts of fortifier and sweetener. Reported only if wine volume is selected as the volume option above. We'll need to specify the initial specific gravity of the must sgm in order to calculate the alcohol produced during the fermentation from the drop in specific gravity. We'll use the Balling Method to calculate the amount of alcohol produced because it's simple to apply and seems to be just as accurate as the other SG-drop methods. In this case the known values are vi (or vf), sgm, awf, Bf, sgf, sgfa, awfa, and msa. Since we're not adding a sweetener in this case we can eliminate the terms msa and Bs. We need to solve for vf (or vi), sgi, awi, Bi, and vfa. Since sgi, awi, and Bi are all interdependent, we'll need to iterate to find a solution. After the "ideal" fortification point is calculated, the user has the option to override the calculated value of sgi in order to model the impact of fortifying at a different SG. When this is done, we first calculate the resulting value of awi using the Balling method and the value of Bi using the Hackbarth model. If the value of sgi entered by the user is lower than the ideal value, then there is not enough residual sugar to achieve the target sugar content. In this case we can then solve equation (19) or (22) above, depending on whether the initial volume or the target volume were specified, and then solve equations (20) and (21) to determine the required additions of fortifier and sugar. The Hackbarth SG Calculator utilizes the Hackbarth model to estimate SG from given values of alcohol content and sugar content. Its purpose is mainly to test and validate the Hackbarth calculation in FermCalc, but it is also useful in the preparation of fortified wines and liqueurs. Alcohol Content – Alcohol content of the solution. Range: 0% to 100% vol/vol. Sugar Content – Sugar content of the solution. Range: 0% to 100% by wt. Calculated SG – The calculated specific gravity (20°C/20°C) of the solution. Specific gravity is calculated using the Hackbarth model for calculating the specific gravity of ethanol-sucrose solutions. The model has a temperature basis of 20°C (68°F). Last updated 14 August 2018.